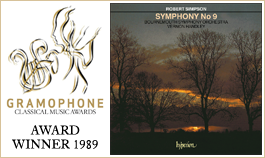 This symphony, commissioned by the Bournemouth Symphony Orchestra with funds provided by the Arts Council of Great Britain, and first performed by them on 8 April 1987 under Vernon Handley, is dedicated to the composer’s wife Angela. While being true to himself, Robert Simpson acknowledged the influence on it of several other composers with whom he had a lifelong sympathy. 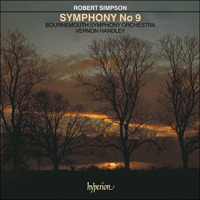 Throughout his life, Simpson was fascinated by two aspects of the music of the great Viennese Classical composers – their handling of large-scale tonality, and their handling of rhythm. It was his abiding ambition to recapture the sense of energy that Mozart, Haydn and Beethoven produced, and which has largely been lost since then. As a means of exploring this Simpson set himself various tasks. He wrote his First Symphony, for example, with a basic pulse throughout, upon which contrasting tempi are achieved by varying the pace of thought. Tonality as it is generally understood is also a potent force, A major being pitted against its most distant rival, E flat. 1: A long stretch of music in the manner of a chorale-prelude, gradually gathering energy for the Scherzo that forms its apex. The Scherzo itself creates another climax, but cannot be thought of as a separate movement. 2: An Adagio, at first fugal, then building a great climax with a set of variations on a palindrome, followed by a peaceful coda. Important features of the Symphony also derive from one of Simpson’s other abiding interests, the music of J S Bach. The opening is based on the chorale-prelude idea – a form which provides a composer with fascinating problems, for both the slow motion of the chorale itself and the faster motion of the surrounding material must hold the hearer’s attention, and neither must swamp the other.